There are buses from Miyazaki station, Miyako city, and buses from Sheraton Grande Ocean Resort on the weekends. Turn right at Ichinomiya Junction after Miyazaki IC on the South Line, Hitotsuba toll road. Turn right at Ferry terminal junction after Miyazaki port junction. Drive straight east on the street in front of Miyazaki City Hall and turn left at Ferry terminal junction. Turn right at Ferry terminal junction. From Hyuga north areas, turn left at Ferry terminal junction after the North Line, Hitotsuba toll road. There are buses from JR Sannomiya station to Kobe Sannomiya ferry terminal. 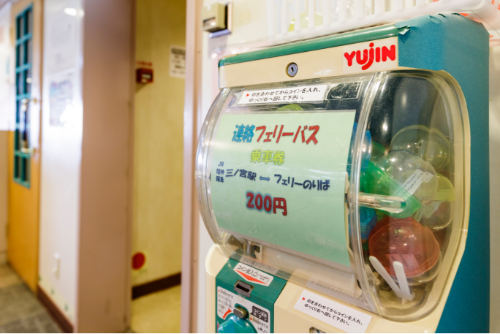 There are 200 yen bus tickets that you can buy on the ferry that are usually 210 yen. You can buy it by the 3F store at the capsule-toy vending machine. Turn left on the T intersection once getting of Kyobashi IC. After that, go into the far-right lane. Turn right at the first light 200m ahead at Zeikan-honchou-mae. Once you past Fukaehama, get in the far-right lane, and go straight passing Uozakihama junction and the junction ahead into Hyperway. After staying on the far-right lane, go into the left lane once passed Maya. Go lightly right at the light of 4th Tottei intersection after getting off at Shinko exit. Turn left at the second light at the 3rd Tottei intersection. Turn left at the Sannomiya intersection before JR Sannomiya eki-mae.